We recommend you to have npm and Node.js already installed on your machine to quickly boot up a http server to display the page we will create. Request an evaluation API key to access the service you want to use the SDK with. Note - It is possible to have a single key(app) for all TomTom services, but you can also choose to have individual keys for the different services. Our SDK comes in two flavors, with raster and with vector maps. By default it comes with raster maps, but as you can see in the page above you can also download the SDK with vector maps. For this particular example we will use vector maps, so please download Maps SDK for Web with vector maps. 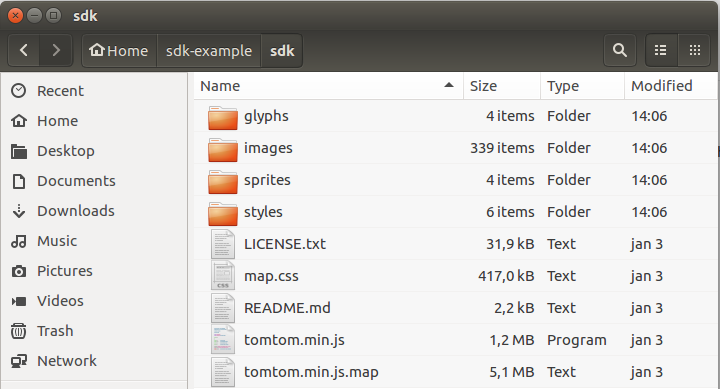 Create a new directory for our example and extract there the SDK. images - images used by widgets, POI icons, etc. These are all the elements required for vector maps to work. 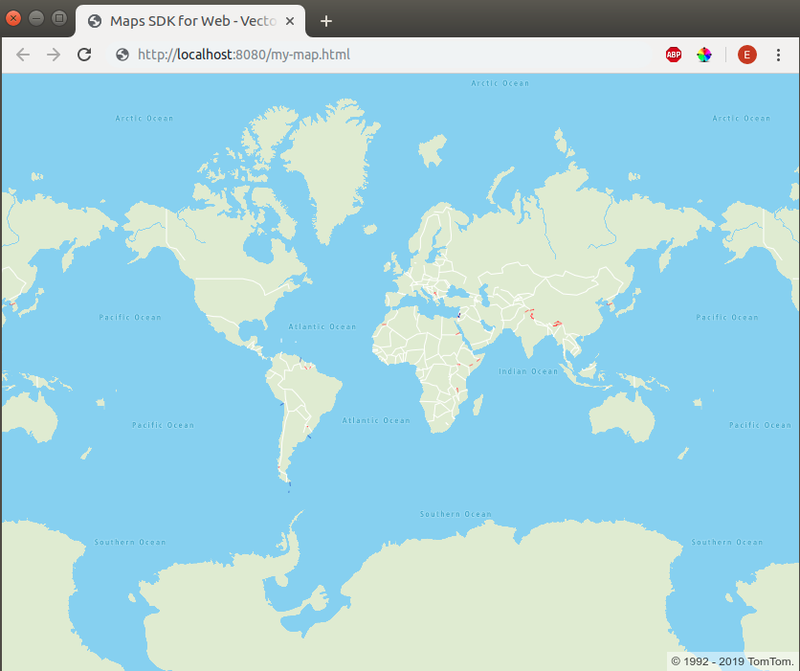 Now let’s create a basic HTML5 file to display a map. For this example I created a file named my-map.html as you can see below. In this line we include the styles used in the map. In this line we load the Tomtom JS SDK, so that we can create our map. Don't forget to replace <your-product-name> and <your-product-version> with the correct values. For instance, as a product id you may use product name followed by your domain name (e.g., myproduct.example.com). This block will load a Tomtom map in the element with id ‘map’. Don’t forget to replace <your-api-key> with you key and <your-tomtom-sdk-base-path> with the sdk base path in your project, in our case it would be /sdk. In point 2 we mentioned that our sdk contains several styles that can be used in the map. For more information on this please refer to our Map Styles example and TomTom Layer documentation. We need a basic HTTP server to display the page we created in the previous step. For this part we are going to use npm and node js, so please make sure you have it installed on your machine. This will create a directory called node_modules in sdk-examples and will contain the http server module and its dependencies. You are all set and ready to start developing! To see the result, open your favorite browser and navigate to http://localhost:8080/my-map.html.